With this Nimar Flat Port , you can capture the beauty of the underwater world with your Canon EF 100mm f/2.8 Macro USM or L Macro IS USM, AF DC-Nikkor 105mm f/2D, AF-S VR Micro-Nikkor 105 mm f/2.8G IF-ED, Sigma 105mm f/2.8 Macro DG OS HSM, Tamron SP 90mm f/2.8 DiVC USD, or Sony FE 90mm F2.8 Macro G OSS lens attached to a compatible camera in one of Nimar's underwater DSLR housings. 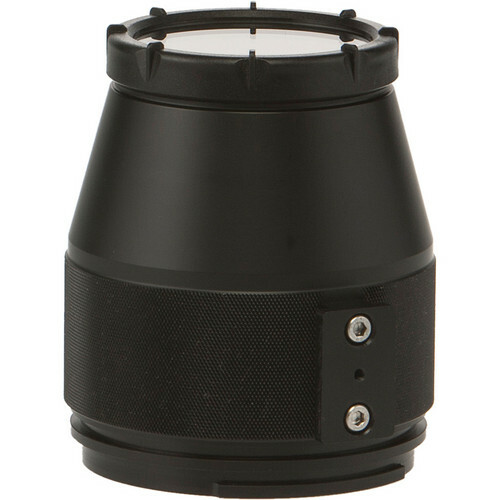 The port safeguards the lens at depths up to 197' with its watertight design. It features a flat glass front element, which magnifies an image more than spherical or dome ports and is better for extreme close-up shots. The port also has a bayonet mount, and a durable Delrin acetal resin body. Box Dimensions (LxWxH) 8.268 x 6.929 x 5.118"